Secretary of Defense Chuck Hagel said the Pentagon has to choose between a small high tech force or a larger one with antiquated equipment if the services are forced to live in a budgetary world dictated by the mandatory budget cuts known as sequestration, he told reporters in a Pentagon briefing on Wednesday. 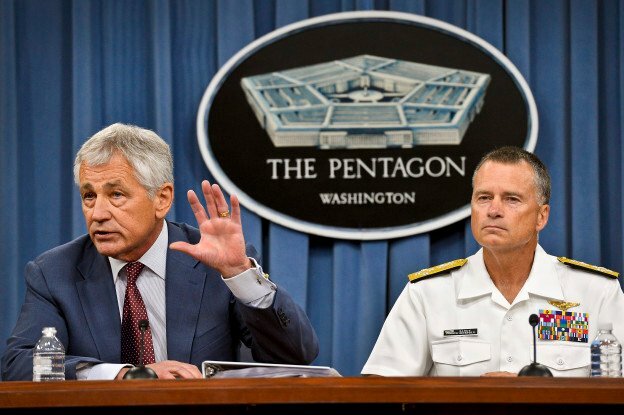 “The basic tradeoff is between capacity – measured in the number of Army brigades, Navy ships, Air Force squadrons and Marine battalions – and capability – our ability to modernize weapons systems and to maintain our military’s technological edge,” Hagel said. Faced with almost a $ 1 trillion in defense reductions over the next decade if the sequestration cuts from the 2011 Budget Control Act, Hagel had the Pentagon conduct the Strategic Choices and Management Review (SCMR). The four-month SCMR was designed to realign the Pentagon’s strategic priorities based on the limited recourses of sequestration and further reductions in military spending. It presents the services, the administration and Congress with a menu of options to bring costs down and will inform the Fiscal Year 2015 Pentagon budget and next year’s Quadrennial Defense Review — the military’s strategic four-year planning document. “In the first approach, we would trade away size for high-end capability. This would further shrink the active Army to between 380,000 to 450,000 troops, reduce the number of carrier strike groups from 11 to eight or nine, draw down the Marine Corps from 182,000 to between 150,000 and 175,000, and retire older Air Force bombers,” Hagel said. The technical option would result in a force that “would be much smaller and able to go fewer places and do fewer things, especially if crisis occurred at the same time in different regions of the world,” he said. The second option would sacrifice modernization programs — and the defense industry that develops them — for a larger force better able to project power but under “a decade-long modernization holiday,” Hagel said. As the war in Afghanistan draws to a close, Hagel implied forces needed to fight those conflicts could be reduced at a greater rate than forces needed to execute the Pentagon’s Pacific pivot strategy. “The analysis concluded that we can strategically reduce the size of our ground and tactical air forces – even beyond the current drawdown,” Hagel said. The review also found the military needed to take a second look at the compensation packages for troops. Under the rules of the BCA, the Pentagon can not include military pay and benefits as part of the 10 percent sequestration. Those proposals will be folded into the FY 2015 budget. Congress has until Oct. 1 to lift the prohibitions of the BCA before the Pentagon gets hit with a $52 billion round of cuts for the start of Fiscal Year 2014.